Why get an MBA degree? There are many good reasons to do it. But, fundamentally, an MBA course is an opportunity to (i) develop yourself and (ii) enhance your career prospects. MBA programs are used to build skills and credentials. MBA studies may be ideal if you want to manage and lead. A Master of Business Administration degree remains an asset no matter what twists and turns your career may take. The business administration skills developed in getting an MBA are useful in any organisation. The qualification is advantageous when applying for any professional position. An MBA is a generalist course. It exposes you to diverse business administration roles, better positioning you to manage teams and complex processes. Specialist study streams are also available within many programs. A key feature of the MBA degree is formal learning of how to manage and lead. You may study topics such as managing teams, leadership, strategic planning, organisational behaviour, and operations management. Applied projects within the program may allow you to gain some practical experience. But, generally, you learn concepts and theory. As an MBA student, you are normally expected to bring significant real-world experience into the program. Learning theory is useful because you have those experience to draw upon. Experience gives theory meaning. Accounting. Students learn to read, interpret and create financial statements. Accounting is the language of business and useful in many business roles. Business Law. Business management and the law often come together, with business needing to comply with numerous rules, regulations and other legal requirements. Business law courses help non-lawyers better navigate legal frameworks and systems. Economics. Studying economics teaches you concepts around pricing, value and markets. Finance. Financial skills are always in demand. Students learn about investing, borrowing, budgets and cash flow management. Marketing. In marketing classes, you learn how to efficiently acquire customers and generate sales. Topics may include advertising, internet marketing, branding, research and performance evaluation. International Business. The modern economy is globally integrated, with enormous cross-border flows of good and services, currencies, knowledge and capital. International business units teach you about managing operations in this environment. An MBA has the potential to provide a tremendous career boost. It changes both you and how you are perceived. Over time, as the MBA salary calculator shows, the salary benefits can greatly outweigh short-term costs. The knowledge, concepts and skills acquired in an MBA program can improve performance in almost any job role. Doing an MBA gives you awareness of different areas of business management. You are less likely to have blind spots and weaknesses, and more able to structure work logically. Being a good administrator is not just about doing but also requires good communication. 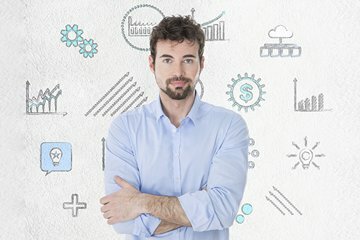 By getting an MBA, you acquire fluency in communicating ideas and actions around business organisation. This helps when dealing with staff, colleagues and others. Being able to speak the lingo of management also boosts job-interview performance. Some people never rise far within an organisation because they don't stamp themselves as leaders. They fail to display a readiness to take on challenges and higher responsibilities. With an MBA in hand, you are signalling ambition for greater things. You made a significant investment towards a future as a leader. An MBA qualification is also a career booster because it demonstrates aptitude. Holding the degree means you were accepted into a program and completed it successfully. Along the way, you gained new skills and knowledge.